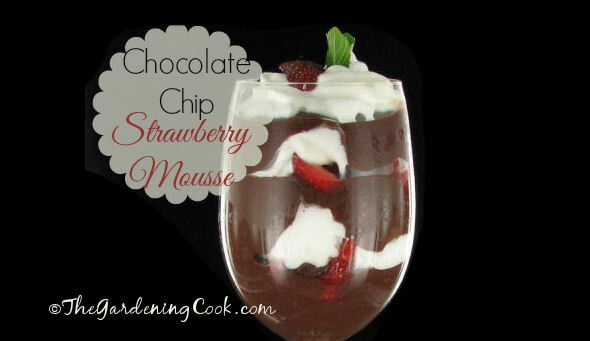 This Strawberry Chocolate Chip Mousse could not be easier to make. 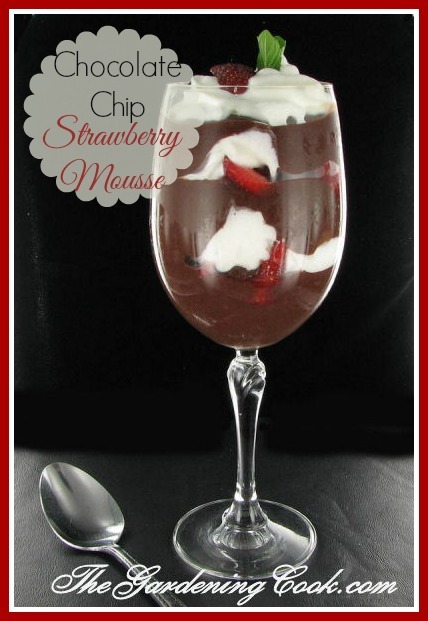 It combines just a few ingredients, all layered in a large wine glass and served with a dollop of whip cream. Best of all, this chocolate mousse is low in calories but still elegant. It is simple enough to make any night and fancy enough to serve at a dinner party! I used fat free sugar free pudding and light whip cream but kept in the real sugar for extra sweetness. It is a fast and easy dessert that can be made and assembled in less than 15 minutes for a busy week night treat. Super low in calories too! Combine the pudding mix, vanilla extract and skim milk in a cold bowl. Whip with a whisk for about 2 minutes and place into the refrigerator. While it is setting, slice the strawberries and mix with the chocolate chips and sugar. Stir several times over about a 5 minute period. The sugar will make a very slight syrup for the strawberries. Take out the pudding and whisk one more time. Add a dollop of whip cream, a slice of strawberry, a few chocolate chips and a sprig of mint to garnish. This dessert needs to be layered just before serving. The sugar makes the strawberries form a slight syrup and if made ahead, it makes the pudding too thin. It only takes a few minutes to layer though. Just do the prepare the strawberry mix and the pudding mix earlier in the day. Then layer at dessert time. Do you make use of things like low fat instant pudding in desserts? Please share some of your ideas in the comments section below. My husband loved it and he’s not a mousse guy. The chocolate chips added a great crunch to it. It was too. I had it last night for dinner. Woweeee!!!! That looks so good! Thanks so much for posting this. Looks delicious! Like your husband I too am not a mousse person, but this just looks too irresistible! What a lovely indulgence – and low fat too! Thanks for all the comments. I can’t believe how great this tasted with so few calories.